The go karts we grew up with as kids are very much in vogue, and in restored condition exchange hands for a surprising amount of money. Aside from nostalgia, reasons for their popularity include their mechanical simplicity and that they are easy to store and transport. 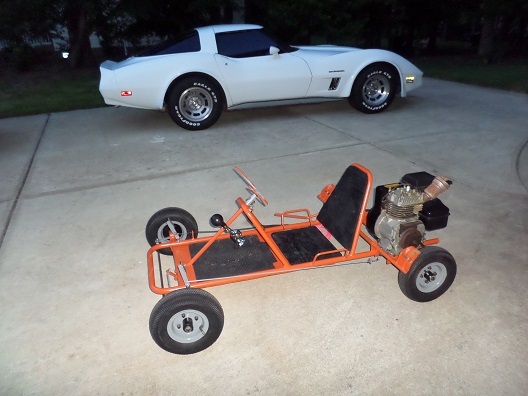 The three basic types of vintage go karts are the yard kart, the race kart, and the car body kart. 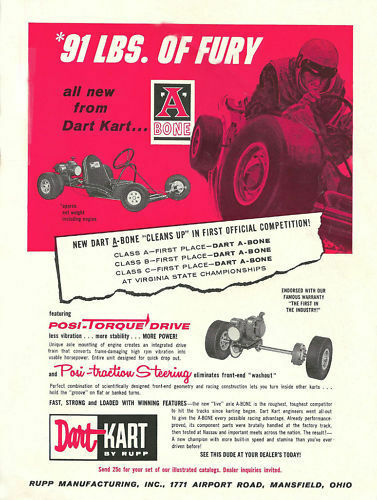 The most common of the vintage karts is the yard kart. These typically have a flat frame with no side supports, no roll cage, and no suspension. Power is supplied from a 5-horsepower or less small engine. 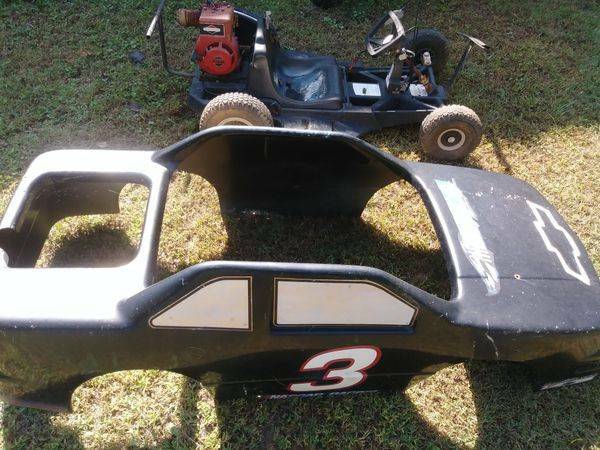 Yard karts are usually one-wheel-drive only, and were not designed for competitive racing, but rather for use on private property, a vacant parking lot, or around a neighborhood. I'm quite sure that Tom Kotter's next book will not be called "The Go Kart In The Barn", but that's where this one was, resting peacefully for several decades before I showed up. Local rodents had made a meal of the original seat vinyl and the gas in the tank smelled like turpentine. The old kart had an impact with a tree years ago leaving the steering linkage slightly bent. Similar to classic muscle cars, the reason that vintage race karts are so rare today is because they were thrashed and abused throughout their lives. 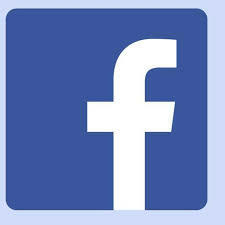 Very few complete original examples still exist, and if you find one, they sell for big money. Most vintage race kart motors were two-strokes, with Mcculloch and West-Bend being two of hottest engines of the day. Before we had the technology to squeeze more power from a single-cylinder small engine, the hot set-up was add a second motor to your race kart. These command the greatest value and had the highest performance of their day. 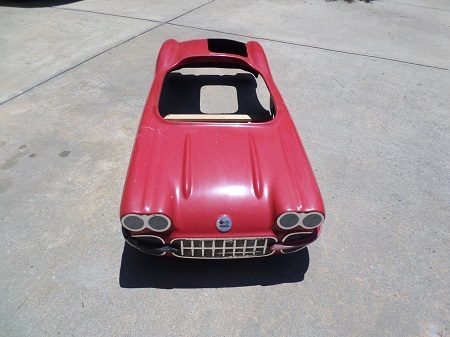 Several years ago, my wife bought me this Manco Corvette kart body for Father's Day. 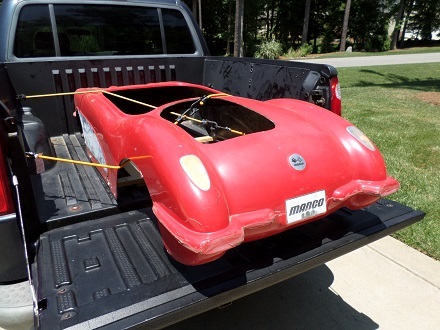 Car body karts are most always made of fiberglass, and for that reason, most haven't survived as well as this one did. The reason it did was, the previous owner had it hanging from a wall inside his house for 15 years. 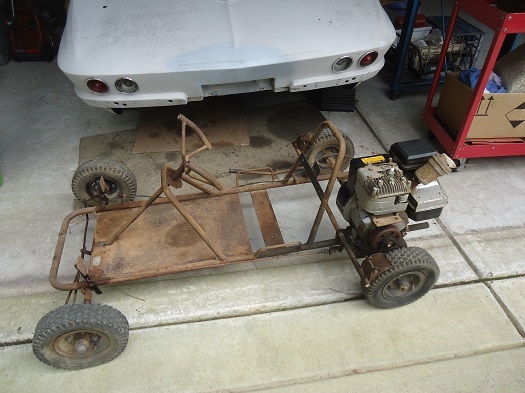 The plan was to find/build/adapt a frame for the Corvette kart body. After a year of fruitless looking for a correct frame, I thought about modifying an existing kart frame. But it's just not in my nature to hack up a perfectly good frame. Plan C was to build a go kart frame from scratch. Unfortunately, this would have been too much of a project in itself. Time wise, It wouldn't have been profitable. So, after several years of moving it around from garage to attic to garage, I listed it on ebay. The guy who bought it gladly drove out from another state to pick it up. Buying an old kart locally is always best, as shipping is very costly due to their size. This #3 go-kart was posted on my local CL early in 2019. Even if you're not a NASCAR fan, this would certainly be a worthwhile project. When complete and restored, vintage car-karts appear at major auction houses like Barrett-Jackson, some selling for $5,000 and up. If you've ever rebuilt an old car engine, it's an absolute joy working on a small gas engine. Many old go karts and mini-bikes were originally fitted with either a Briggs & Stratton or Tecumseh 4-cycle flathead engine. 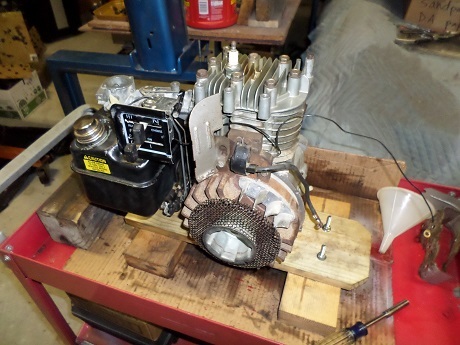 These old flathead motors were durable, reliable and easy to repair.